THE team-up of two of the biggest names in the world of boxing inside a basketball court has been shelved - for now. 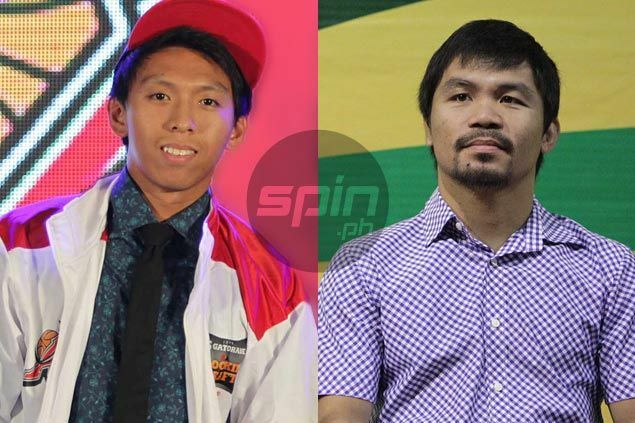 The possibility of a dream Pacquiao-Elorde backcourt was raised when rookie Nico Elorde started practicing with Mahindra, where boxing superstar Manny Pacquiao is playing-coach, three weeks ago. Alaska gave up the rights to Elorde, a grandson of boxing icon Gabriel "Flash" Elorde, after selecting the Ateneo product in the third round at 33rd overall in last month’s PBA rookie draft. The duo would’ve been the Enforcers’ one-two punch – pun intended – in the backcourt. The dream pairing was shelved when the Enforcers recently assigned Elorde to the team’s ABL affiliate Pacman Powervit Pilipinas Aguilas, who has Pacquiao among their bankrollers. But Victolero left the door open for Elorde to fulfill his PBA dream – and a possibly team up with Pacquiao. “(Kung) kailangan namin siya sa future, madali na siya makuha,” the Mahindra coach said of the steady playmaker, who turns 24 on October 4.